A Personalized Boating Gift for Grandpa or Dad will be cherished forever. Make Father’s Day extra special with this Personalized Father’s Day Gift for Dad or Grandpa. Also makes a great personalized gift for Uncle by including the nieces and nephews for a great personalized gift. Your new Personalized T-Shirts for Grandpa is available on our premium white 100% cotton T-Shirt, machine washable in adult sizes S-3XL. Lighthouse boating shirt is also available in Ash Gray. Includes FREE Personalization with any title. That's right any title, Grandpa, Dad, Papa or any special title. Personalize your gift with any title and up to 30 names. Personalized Shirt is printed with our boating theme lighthouse and the word Crew. Looks great. Very happy with this item. very fast shipping and nice quality t-shirts but it is printed on a iron on! I could have done this my self! Im a little disappointed, i guess i was thinking it was going to be a silk screening and its not. It is a print out iron on, so the center of the shirt is thick and heavy and not breathable. love the item and it was all spelled correct and perfect. The size just ran a bit small. 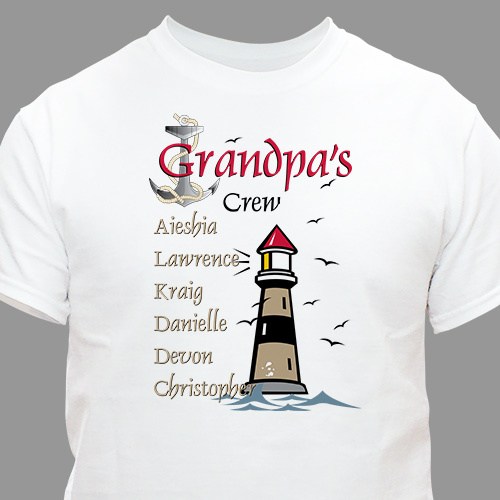 Our Personalized Lighthouse T-shirt Makes great Gift for Grandpa anytime of the year, but makes a unique Father's Day gift or a special gift idea for Grandparent's Day.